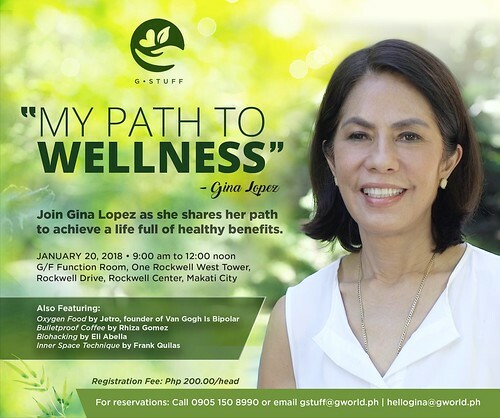 On January 20 (Saturday), Lopez leads a G Stuff Health & Wellness Talk at the Ground Floor Function Room of One Rockwell West Tower, Rockwell Center, Makati, from 9:00am to 12:00nn. Registration fee is P200 per head. Believing that eating well is a pillar of good health, Lopez will talk about the herbs she uses religiously among other things. Discussions on Oil Pulling using virgin coconut oil (VCO), and the select medicinal plants we can benefit from will interest everyone. Health and Wellness is an ever evolving field that we should be open to explore and discover. Lopez has invited guest speakers who are proponents of health and wellness practices in their field. Her close friend Jetro, the founder of Van Gogh Is Bipolar in Sikatuna, Quezon City will give a short talk on ‘Oxygen Food’. He will share how his partner was cured of Stage 4 Pancreatic cancer, through a simple diet that is easy to learn and apply in daily life. Frank Quilas who heads the Clairvision School of Meditation in the Philippines will talk about the Inner Space Technique, a system of releasing your emotional energy through Inner Space Interactive Sourcing. A free IST session with Frank will be raffled off to participants of the talk. Rhiza Gomez will introduce ‘Bulletproof Coffee,’ a high-performance drink that has a massive impact on energy and cognitive function. Free samples of Bulletproof Coffee will be available from a coffee kiosk. Eli Abella will explain ‘Biohacking’—a method of manipulating the internal and external environment that allows practitioners to upgrade their body, mind, and life. A demonstration of biohacking with the use of specific gadgets will be part of the talk experience.